MICHIGAN TRUTH SQUAD ANALYSIS: "Truth"
Proposal 3 would create an amendment to the Michigan Constitution a requirement that 25 percent of the state’s electrical power come from renewable sources by 2025, with certain caveats. The primary proponent group for Prop 3 is Michigan Energy, Michigan Jobs. As of Oct. 26, it had raised about $13 million, much of it from out-of-state environmental groups. The primary opponent is CARE – Clean Affordable Renewable Energy for Michigan Coalition. As of Oct. 26, it had raised nearly $23 million, almost all of it from the two major utilities – Consumers and DTE. Questionable statement: Why are the backers of proposal 3 resorting to outright lies. They say utility bills in Illinois are going down. 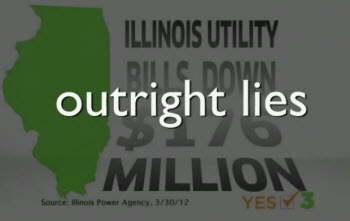 Truth: Utility bills in Illinois are soaring. So much for that lie." The ad cites a Crain’s Chicago Business story of May 10, 2012, which does use the word "soar" in its headline. The story is about impending increases for customers of ComEd due to market and policy actions taken in the state. ComEd is Illinois’ largest electric provider, but according to statistics from the federal Energy Information Administration, ComEd had only about one-third of the retail sales in the state in 2010. ComEd’s position in the residential market is larger than it is for commercial and industrial markets. "The decline in power demand has meant that high-priced ComEd contracts that the state negotiated with parent Exelon Corp. five years ago in a bid to stabilize long-term rates at a time when energy costs were thought to be rising in the future will account for the vast majority of the energy price ratepayers shoulder when the summer ends." Questionable statement: "No other state has locked it into their constitution." Correct. The nonpartisan Citizens Research Council says that Proposal 3’s constitutional status would be unique. However, the pro ad attacked in "Truth" says Prop 3 is "just like" energy plans in other states. It did not explicitly say that other states have constitutional mandates. Questionable statement: "Proposal 3 will cost Michigan families thousands of dollars in higher electric bills." As previously detailed by Truth Squad, even a study paid for by Prop 3 opponents could not put a dollar figure on how much a residential electric customer would pay in increases due to Proposal 3. Overall impression: In the parlance of political speech, a term such as "outright lies" qualifies as a white-hot accusation. If you are going to use such loaded language, be ready to offer an air-tight case. This ad has holes, though. Foul or no foul: Foul. The $176 million figure used by proponents is a dodge, but not an "outright lie." Worse, the ad uses the Crain’s story in a misleading way. ComEd bills are going up -- not bills for all Illinois utility customers. And, once again, opponents are stating as fact that there will be "thousands of dollars" in higher bills for Michigan families, without providing reasonable evidence to prove it.